Boston is one of the oldest cities in the United States in 1630 by Puritans from England. Boston is a city steeped in history and includes the United States’ first public school (Boston Latin School, 1635), first subway system (Tremont Street Subway, 1897), and first public park (Boston Common, 1634), first university (Harvard, 1636), and much more. It’s a city famous for sports, Matt Damon, the Boston Tea Party, sports, Aerosmith, Faneuil Hall, clam chowder, cool accents, colonial history, great food, welcoming people, education, Sylvia Plath, sports, Ben Affleck, JFK, Isabella Stewart Gardner, Clara Barton, and, of course, sports! We’re super excited to host TravelCon in this history city! TravelCon will be held at the The Westin Copley Place in Boston, Massachusetts. Located in Boston’s trendy Back Bay area and connected to the Copley Place Mall, this hotel offers luxury amenities and first-class accommodations. 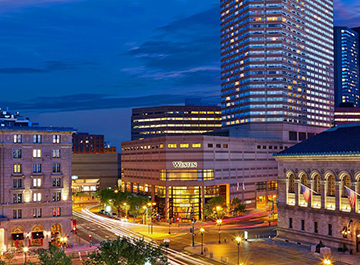 The Westin Copley Place, Boston is only moments from a variety of popular points of interest such as Fenway Park, Boston Common and the Theater District. Shopping at Prudential Center, the scenic Charles River and an exciting nightlife are seconds away. The address is 10 Huntington Avenue. Rooms at the Westin will be $249 a night for conference attendees and sponsors. To ensure that only our attendees secure this special room rate, a private booking link will be sent to you after you register!